John D. Rockefeller, an American industrialist (a person who owns or oversees an industrial corporation) and philanthropist (a person who works to help mankind), founded the Standard Oil Company, the University of Chicago, and the Rockefeller Foundation. 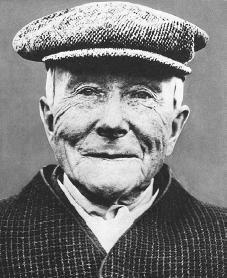 John Davison Rockefeller was born on July 8, 1839, in Richford, New York, the second of six children. His father owned farm property and traded in many goods, including lumber and patent medicines. His mother, who was quite the opposite of his father's fun-loving ways, brought up her large family very strictly. After living in Oswego, New York, for several years, the family moved to Cleveland, Ohio, in 1853, when it was beginning to grow into a city. John graduated from high school there and excelled in mathematics. After graduation Rockefeller attended a commercial college for three months, after which he found his first job at the age of sixteen as a produce clerk. In 1859, at age nineteen, he started his first company, Clark and Rockefeller, with a young Englishman. They grossed (money earned before expenses) four hundred fifty thousand dollars in the first year of trading. Clark did the fieldwork while Rockefeller controlled office management, bookkeeping, and relationships with bankers. From the start Rockefeller showed a genius for organization and method. The firm prospered during the Civil War (1861–65), when Confederate (Southern) forces clashed with those of the Union (North). With the Pennsylvania oil strike (1859) and the building of a railroad to Cleveland, they branched out into oil refining (purifying) with Samuel Andrews, who had technical knowledge of the field. Within two years Rockefeller became senior partner; Clark was bought out, and the firm Rockefeller and Andrews became Cleveland's largest refinery. With financial help from S. V. Harkness and from a new partner, H. M. Flagler (1830–1913), who also secured favorable railroad freight rebates, Rockefeller survived the bitter competition in the oil industry. The Standard Oil Company, started in Ohio in 1870 by Rockefeller, his brother William, Flagler, Harkness, and Andrews, had a worth of one million dollars and paid a profit of 40 percent a year later. While Standard Oil controlled one-tenth of American refining, the competition remained. Rockefeller still hoped to control the oil industry. He bought out most of the Cleveland refineries as well as others in New York, Pittsburgh, and Philadelphia. He turned to new transportation methods, including the railroad tank car and the pipeline. By 1879 he was refining 90 percent of American oil, and Standard used its own tank car fleet, ships, docking facilities, barrel-making plants, depots, and warehouses. Rockefeller came through the Panic of 1873, a severe financial crisis, still urging organization of the refiners. As his control approached near-monopoly (unfair control over an industry), he fought a war with the Pennsylvania Railroad in 1877 which created a refining company to try to break Rockefeller's control. But bloody railroad strikes (workers' protests) that year forced them to surrender to Standard Oil. Rockefeller's dream of order was near completion. Standard Oil Trust received the stock of forty businesses and gave the various shareholders trust certificates in return. The trust had a worth of about seventy million dollars, making it the world's largest and richest industrial organization. In the 1880s the nature of Rockefeller's business began to change. He moved beyond refining oil into producing crude oil itself and moved his wells westward with the new fields opening up. Standard also entered foreign markets in Europe, Asia, and Latin America. From 1885 a committee system of management was developed to control Standard Oil's enormous empire. Public opposition to Standard Oil grew with the emergence of the muckraking journalists (journalists who expose corruption), in particular, Henry Demarest Lloyd (1847–1903) and Ida Tarbell (1857–1944) who published harsh stories of the oil empire. Rockefeller was criticized for various practices: railroad rebates (a system he did not invent and which many refiners used); price fixing; and bribery (exchanging money for favors); crushing smaller firms by unfair competition, such as cutting off their crude oil supplies or restricting their transportation outlets. Standard Oil was investigated by the New York State Senate and by the U.S. House of Representatives in 1888. Two years later the Ohio Supreme Court invalidated Standard's original trust agreement. Rockefeller formally disbanded the organization and in 1899 Standard was recreated legally under a new form as a "holding company," (this merger was dissolved by the U.S. Supreme Court in 1911, long after Rockefeller himself had retired from active control in 1897). Perhaps Rockefeller's most famous excursion outside the oil industry began in 1893, when he helped develop the Mesabi iron ore range of Minnesota. By 1896 his Consolidated Iron Mines owned a great fleet of ore boats and virtually controlled Great Lakes shipping. Rockefeller now had the power to control the steel industry, and he made an alliance with the steel king, Andrew Carnegie (1835–1919), in 1896. Rockefeller agreed not to enter steelmaking and Carnegie agreed not to touch transportation. In 1901 Rockefeller sold his ore holdings to the vast new merger created by Carnegie and J. P. Morgan (1837–1913), U.S. Steel. In that year his fortune passed the $200 million mark for the first time. Rockefeller, from his first employment as a clerk, sought to give away one-tenth of his earnings to charity. His donations grew with his fortune, and he also gave time and energy to philanthropic (charity-related) causes. At first he depended on the Baptist Church for advice. The Church wanted its own university, and in 1892, the University of Chicago opened. The university was Rockefeller's first major philanthropic creation, and he gave it over $80 million during his lifetime. Rockefeller chose New York City for his Rockefeller Institute of Medical Research (now Rockefeller University), chartered in 1901. In 1902 he established the General Education Board. The total of Rockefeller's lifetime philanthropies has been estimated at about $550 million. Eventually the amounts involved became so huge (his fortune reached $900 million by 1913) that he developed a staff of specialists to help him. Out of this came the Rockefeller Foundation, chartered in 1913, "to promote the well-being of mankind throughout the world." He died on May 23, 1937, in Ormond, Florida. Rockefeller's personal life was fairly simple. He was a man of few passions who lived for his work, and his great talent was his organizing genius and drive for order, pursued with great single-mindedness and concentration. His life was absorbed by business and family (wife Laura and four children), and later by organized giving. He created order, efficiency, and planning with extraordinary success and sweeping vision. Chernow, Ron. Titan: The Life of John D. Rockefeller, Sr. New York: Random House, 1998. Coffey, Ellen Greenman. John D. Rockefeller, Empire Builder. Englewood Cliffs, NJ: Silver Burdett, 1989. Harr, John Ensor, and Peter J. Johnson. The Rockefeller Century. New York: Scribner, 1988. Harr, John Ensor, and Peter J. Johnson. The Rockefeller Conscience: An American Family in Public and in Private. New York: Scribner, 1991. Nevins, Allan. Study in Power: John D. Rockefeller, Industrialist and Philanthropist. Norwalk, CT: Easton Press, 1989. Segall, Grant. John D. Rockefeller: Anointed With Oil. New York: Oxford University Press, 2001. There is no mention of J.R. sexual proclivities. I, for one, would be interested in learning a little more about them. I was looking at this article, and the information seems to be pretty well-worded. The only thing that I would like to see more of is his personal life. Because this is a biography, that would have been very helpful to me. The information provided is quite thorough. However, it is true about that there is not enough of his personal life. When kids are asked to write about a famous person, you would expect to be able to read about his private life as well.